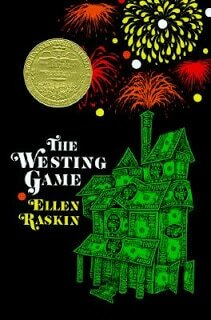 The Westing Game is another favorite of Seth’s from his childhood. I really like the book but it was extremely confusing at first. The book introduces tons of characters all at once in the beginning. It takes quite awhile before you are able to straighten all of the characters out and remember the characteristics of each. The book is clever and it keeps you guessing all the way until the very end. There are multiple times when you think you have figured it out but you are still way off target. It is a little bit of a tougher read when it comes to books for elementary school students because it requires so much remembering. Although it is still a pretty quick read. This books is definitely worth a read if you are into mysteries at all. It is a mystery but a very different kind. We totally did this book a couple of months ago for book club! I loved it! I was one of those that thought I figured it out towards the beginning (in my sleep, no less) and then was shocked at how it turned out. A great who-dunit book. I love, love, love this book! It's been my favorite since I was a kid. My mom taught it to all her sixth graders. Don't you love Turtle? She's my favorite.